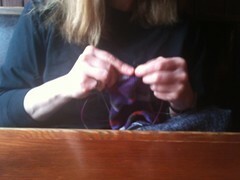 Who is this mystery knitter, with fingers flying so fast they're blurred? LOL! Hmm. I wonder who that could be. Could it be Chaotic Chris? I think Mary Lou may be on to something, they are stripey socks after all, and we know how May is. And they are purple -- definitely Chris!